The 600R header has been produced world wide more than 650,000 times since 1996. The design was tested and continuously improved over the past years to offer outstanding reliability. 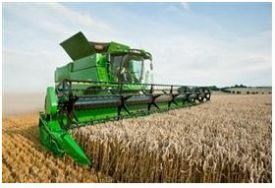 It offers useful features like the possibility to adopt the table length mechanically to the crop. Controlling of the header is integrated into the joystick and provides automatic control of stubble height, lateral tilt and ground pressure mode. Up to three different header and reel positions can be saved via the “1-2-3” Buttons on the joystick. All 600R Headers are equipped with a manual adjustable cutterbar. The cutterbar can be set to three different positions to match the varying crops and conditions. 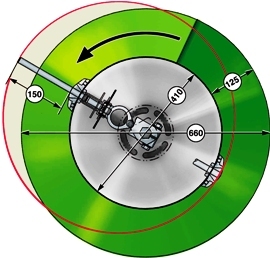 The auger-to-cutterbar adjustment provides the unique possibility to adjust the platform for best feeding in all crops. Stainless-steel feed plates are standard equipment on the 600R Series Cutting Platforms. 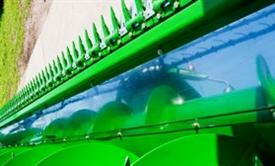 These plates, between the cutterbar and large intake auger, provide smoothest feeding surface for an optimized crop flow and guarantees a rust-free operation through the years. The stainless-steel feed plates providing a very smooth surface which provides you a unique feeding capability. 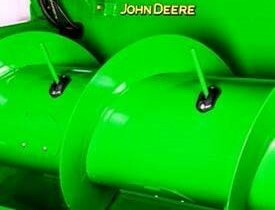 Compared to usual steel plates the stainless version from John Deere guarantees an always rust-free operation even after several years which allow having the best crop flow from the very first day year after year. The heavy-duty driveline for the auger and cutterbar on the left-hand side of the cutting platform is designed for the biggest throughput and best efficiency and part of the 600R base configuration. The heavy-duty knife drive gearbox keeps the operator’s head running. The knife gearbox features a cutting speed of 581 rpm for the 616R up to 622R and 627 rpm for the 625R up to 635R Headers and has a stroke of 89 mm (3.5 in.). 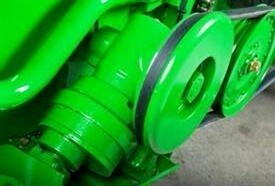 The special-designed gearbox maintains a smooth linear knife motion for reliable vibration-free operation. This gearbox design keeps the header running. All 600R Series Cutting Platforms feature a large, 660-mm (30.7-in.) auger with deep auger flights to handle large amounts of crop. This design provides a very big area under the auger to aggressively feed large volumes of crop material. 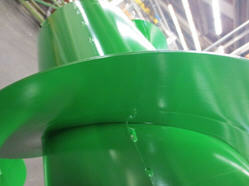 The high-capacity auger is available in two different versions, the standard auger and the wear-resistant auger. A unique feature of the 600R Series Headers is the quick adjustability of the auger in two directions: depth and height. 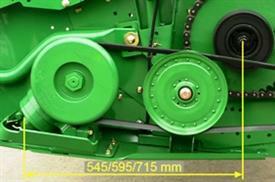 This quick adjustment allows the operator to optimize the header for any crop and condition (for example, set the auger up for harvesting rapeseed) for smoothest feeding, an optimal match for the high performance of the John Deere combines. As mentioned above the 600R Series Cutting Platform augers come standard with full-width retractable fingers. This means that there is always one additional finger between each wrap of auger flights which helps to move tough or green crop faster and creates a more even feeding. The high-capacity auger is easy to maintain and has a great uptime. Each intake finger can be reached easy and comfortable by special designed service doors on the intake auger to keep uptime high and the harvest efficient. The intake auger position is adjustable for maximum versatility. The retractable fingers are 16 mm (0.63 in.) in diameter with a reach of 125 mm (4.9 in.). 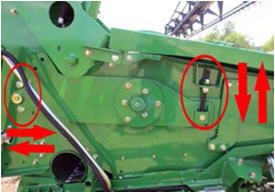 Fingers have a breakaway groove and are secured with a retainer preventing them to enter on the combine. Replacement is fast and easy. 600R Front-End Equipment is equipped with two HeaderTrak™ sensors that follow the contour to ensure an even stubble height and minimize the risk of damaging the header in uneven terrain. The HeaderTrak sensors are located on the left and right side of the header. The automatic-control, programmable header functions provide optimum performance and operator ease and comfort. 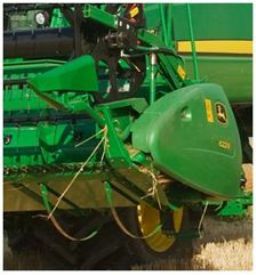 The 600R Front-End Equipment is equipped with two HeaderTrak sensors that follow the contour to ensure an even stubble height and minimize the risk of damaging the header in uneven terrain. The HeaderTrak sensors are located on the left and right side of the header. The 630R Header comes with two HeaderTrak sensors in base. An additional third HeaderTrak sensor is optionally available to ensure maximum performance in uneven terrain. The 635R Header comes with three HeaderTrak sensors. An additional sensor in the center of the front-end equipment supports the outer sensors in uneven terrain to ensure maximum performance.